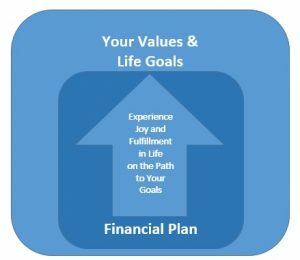 We believe we must deeply understand your essential life goals and motivations before formulating a financial plan. This may sound obvious and trite. But few of us ever stop and reflect on why we do what we do. Rarely do we contemplate what is most meaningful and important to us. Our process will help you clarify your deepest values and goals and build your financial plan to support them. Our financial planning is really about building a plan that helps you live a meaningful life. Your life is of utmost importance and money is merely a tool to support your living. Many people spend their life wishing they had more, or chasing after what they do not have. They believe getting it would bring happiness and fulfillment. Interestingly, getting that thing rarely has the effect they desire. This causes worry and discontent. People worry that they will not get their wants because they don’t have what it takes or something out of their control will ruin it. They are discontent because even when they get what they want, it does not bring them the satisfaction they envisioned. Not getting the desired outcome causes anger, sadness, and discouragement. This cycle of desire followed by chasing and disappointment makes us depressed and drains us of energy and finances. We help you get out of that vicious cycle. In the process, most people find that they had everything they needed for a joyful, fulfilling life all along. They were just wasting their thoughts, energy and resources on things that were not actually important. All it takes is letting go of the illusion that happiness is somewhere else by making the most of what you already have. If you live with the mindset that happiness comes only when a goal is achieved—you spend most of your time wishing, wanting, and being anxious. When obstacles come, they can bring despair and make you want to quit. You think you will never reach your goal and therefore never be happy. When you start with your “why” and set up a system to live in alignment with your beliefs—something incredible and powerful happens. You find joy in your daily work, and you discover an extra reserve of energy to overcome obstacles. When your happiness hinged on an outcome, you despaired when the outcome appeared in doubt. But when you live in alignment with your beliefs, you have the ability to stay content in the moment and readjust to achieve your goal—even in the worst circumstances. And in the end, contentment, purpose, and joy is what we all really want. We can help you make sense of your finances to get the most out of your life. You will find happiness and contentment in the process!